Ingredients: Quail, chickpea, pea, potato, turkey meal, pea protein, pork meal, tapioca, chicken fat (preserved with mixed tocopherols), pumpkin, ocean fish meal, pea fiber, natural flavor, dried egg, dicalcium phosphate, potassium chloride, salt, choline chloride, dl-methionine, salmon oil (preserved with mixed tocopherols), carrot, parsley, apple, cranberry, blueberry, lettuce, celery, beet, watercress, spinach, dried chicory root, broccoli, spearmint, almond oil (preserved with mixed tocopherols), sesame oil (preserved with mixed tocopherols), yucca schidigera extract, dried kelp, thyme, lentil, vitamin A supplement, vitamin D3 supplement, vitamin E supplement, zinc sulfate, niacin, ferrous sulfate, l-ascorbyl-2-polyphosphate, calcium pantothenate, thiamine mononitrate, copper sulfate, riboflavin, pyridoxine hydrochloride, manganese sulfate, zinc proteinate, folic acid, calcium iodate, manganese proteinate, copper proteinate, sodium selenite, biotin, vitamin B12 supplement, rosemary extract, dried lactobacillus acidophilus fermentation product, dried enterococcus faecium fermentation product, dried lactobacillus casei fermentation product. 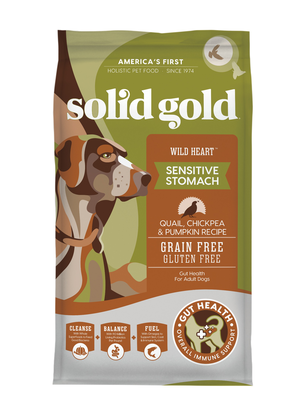 Solid Gold Wild Heart Quail, Chickpeas & Pumpkin Recipe is formulated to meet the nutritional levels established by the AAFCO Dog Food Nutrient Profiles for the maintenance of adult dogs. We'll begin this review of Solid Gold Wild Heart Quail, Chickpeas & Pumpkin Recipe with a detailed discussion of the ingredients. The first ingredient is quail. Quail is a medium size game bird and an excellent novel protein source. However, raw quail contains a significant amount of moisture. After cooking, the relative meat contribution of quail is dramatically reduced. Therefore, it's important to ensure that other meat sources are included within the first few ingredients to ensure the product derives most of its protein from meat. The second ingredient is chickpea. Chickpeas (also known as garbanzo beans) are an excellent carbohydrate source, naturally rich in dietary fiber and protein. The third ingredient is pea. Peas are starchy members of the legume family. Other than carbohydrates, peas are notably high in plant based protein and various vitamins and minerals. The fourth ingredient is potato. Potatoes provide a notable amount of dietary fiber, vitamins, minerals, and antioxidants. In addition, potatoes are gluten free and therefore commonly found in grain free and gluten free products. The fifth ingredient is turkey meal. Turkey meal is produced by cooking turkey using a process called rendering. The rendering process dramatically reduces the natural moisture of turkey and thereby results in a highly condensed protein source. Because ingredients are listed in order of pre-cooked weight, the remaining ingredients in Solid Gold Wild Heart Quail, Chickpeas & Pumpkin Recipe are not as important as the first five ingredients. Next we have pea protein. Pea protein is produced by removing the starchy parts of peas. Pea protein is considered controversial because it provides a substantial plant based protein boost. This boost is undesirable because plant based protein is typically lower in biological value when compared to meat based proteins. The next ingredient is pork meal. Pork meal is produced by a process called rendering. In short, the rendering process involves cooking pork until the moisture level falls below 10%. By removing the moisture, we're left with a concentrated protein powder made with pork (i.e. pork meal). Then we have tapioca. Tapioca is a gluten-free starch extracted from cassava roots. Starch is a necessary component in producing kibble and tapioca is an excellent choice in this regard. Moving on, we have chicken fat (preserved with mixed tocopherols). Fat is an important part of your dogs diet, chicken fat in particular is an outstanding source of omega-6 fatty acids. Moving on with this review, we have pumpkin. Pumpkin is an excellent carbohydrate source, rich in dietary fiber and various minerals. It's also rich in beta-carotene, an antioxidant which is a precursor to vitamin A. The next ingredient in this review is ocean fish meal. Ocean fish meal is produced by cooking ocean fish using a process called rendering. The rendering process dramatically reduces the natural moisture of the ocean fish and thereby results in a highly condensed protein source. Ocean fish can refer to multiple species of fish, since the particular type of fish is not specified, it's difficult to discuss this ingredient. The nutritional contribution of ocean fish depends on the species included; however, fish generally provides high quality protein and fat. Our next ingredient is pea fiber. Pea fiber is a concentrated dietary fiber source. Fiber can help stabilize blood sugar levels and promote colon health. natural flavor is the next ingredient in this recipe, which is used to enhance the flavor of the food. Next on the list is dried egg. Dried eggs consist of shell-free eggs which are easy to digest and contain high quality protein. Egg protein is often given the highest biological value (BV). The BV metric measures the usability of the ingredient's protein. The next ingredient in this recipe is dicalcium phosphate. Dicalcium phosphate (misnomer for dibasic calcium phosphate) is commonly used in pet food and treats as a dietary calcium supplement. 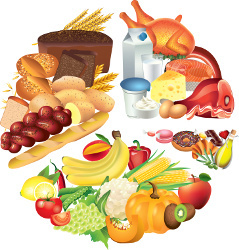 It can also be found in breakfast cereals, enriched flour, noodle products, pharmaceutical tablets, and toothpastes. Next we have potassium chloride. Potassium chloride is a potassium supplement. The next ingredient is salt. Salt is an important mineral for both humans and dogs. Depending on the quantity of salt used (which we cannot determine), salt may or may not be a nutritious addition in the recipe. Then we have choline chloride. Choline chloride is member of the B-vitamin complex (vitamin B4). The remaining ingredients in this Solid Gold Wild Heart recipe are unlikely to affect the overall rating of the product. The official PawDiet rating for Solid Gold Wild Heart Quail, Chickpeas & Pumpkin Recipe is 3.5 out of 5.